Click Start SahiWin exe link on Sahi dashbord. "Sahi windows agent started!" message appears on Sahi Pro console. To Launch Sahi Controller, click the Desktop icon on the Sahi Dashboard. infoMake sure popup blockers are turned off. On the Controller, go to the Record tab and check "enable recording/identification for Windows" checkbox. The Controller can be used to interact with the desktop application. User can Identify, Click, Set, Assert, choose Other Actions, or user can even Test an expression from Evaluate Expression to perform an action on the Windows Desktop application. Launch the Controller and check "enable recording/identification for Windows" checkbox. To identify an element, press the CTRL key, hover over any element and release the CTRL key. infoBlank Prefix means element is present on the taskbar. Start SahiWin exe must be clicked from Sahi Dashboard and ' Windows ' checkbox at right side top most corner in controller must be checked during identification or recording. If during identification, Sahi is identifing background elements, then goto display setting of PC and change Change the size of text, apps and other items to 100% (Recommended). 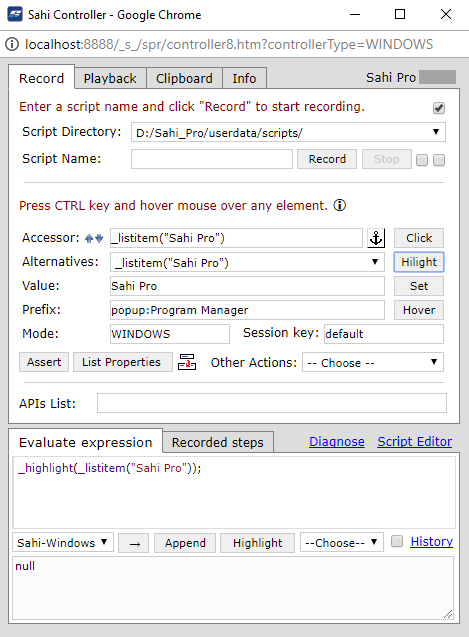 For SilverLight, XBAP (i.e browser based desktop application) during identification, if Sahi is not identifing some boundary elements, then maximize the browser. For better understanding please refer Identify Elements. Evaluating Windows Desktop Application expression through Controller. It helps while identifying elements or while debugging. Click on →. The result will be seen in the bottom box. infoNote: Selecting some text and pressing '→' will only evaluate the selected text. Highlight Can be used on selected text to highlight the element (shows a red 1 pixel border briefly). Invokes the _highlight API. Drop down Lists some actions like Click, Get Value, Get Text etc. infoFor better understanding please refer Evaluate Expression. To record a script, launch the Controller, check 'Windows' checkbox at right side top most corner in controller, give a script name and click 'Record'. Actions done on the Windows Desktop are recorded automatically. Steps can also be recorded from the Controller. A. 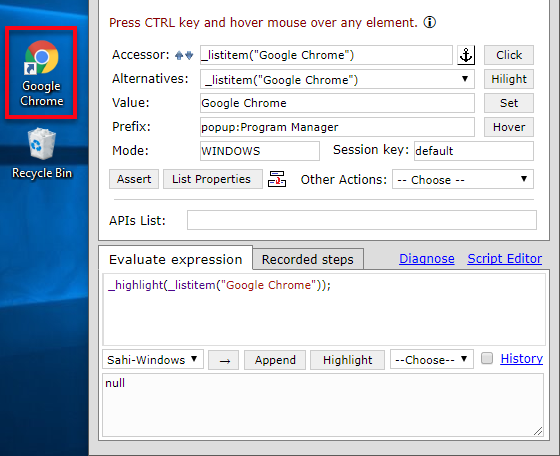 You can use Click, Set, Assert, choose 'Other Actions' to perform an action on the Windows Desktop Application. B. You will need to record these steps explicitly by clicking on 'Append'. Start SahiWin exe must be clicked from Sahi Dashboard and 'Windows' checkbox must be checked in Sahi Controller during identification or recording. Cursor Feedback: During recording, mouse cursor turns to Arrow with Red dot until the step is recorded. For better understanding please refer Record a script. Select Start Mode as Windows. You can leave the Start url blank. This is not used for Windows Desktop Application. Click on Play to playback the script. Click on Logs to view the logs of the played back script. infoNote: A script cannot be played back if Start SahiWin exe is not clicked on Sahi Dashboard. infoFor better understanding please refer Playback Tab. You can playback the script from the Editor as well. Choose the Start Mode as Windows. Choose either of the two options - 'Run in single machine' or 'distributed (multiple machines)'. Press Run to playback the test. For better understanding please refer Editor Playback. infoNote: A script cannot be play back if Start SahiWin exe is not clicked on Sahi Dashboard.